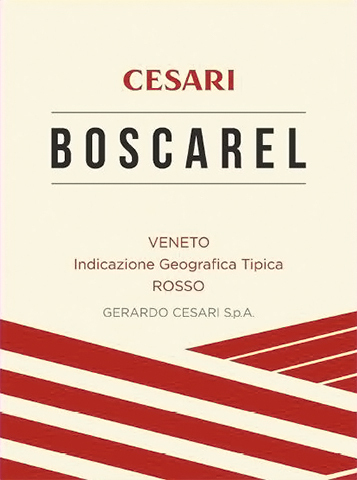 Located near the Cesari cellar in Cavaion Veronese in the province of Verona, the Boscarel vineyard is comprised of morainic, alluvial soil. A highly aromatic young, fresh, single vineyard Super Veneto, Boscarel shows notes of wild berries upfront, quickly followed by hints of violets. It is full in body with soft tannins and a lingering finish. Each varietal is vinified separately after which they are blended together to undergo malolactic fermentation and left to rest for 6 months. An aromatic red, with violet and grilled herb notes accenting the hints of wild strawberry, plum sauce and anise. Light tannins show on the finish. Drink now through 2016. 8,330 cases made. Spice and cedar notes accent the flavors of black cherry, dried herb, currant and pencil shavings in this lively red. Lightly chewy tannins show on the moderate finish. Merlot, Cabernet Sauvignon and Sangiovese. Drink now through 2016.